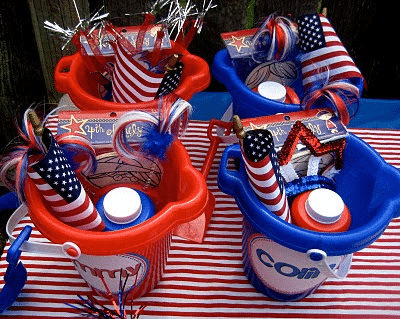 With all of these great frugal fun 4th of July party ideas ideas below, your celebration is going to be out of this world! One thing we know for sure? When it comes to 4th of July, there are picnics, BBQ’s, grill-outs…food everywhere you turn! This year, check out some of these fast and easy 4th of July food dishes and snacks that you can take with you or create at your own patriotic party at home! 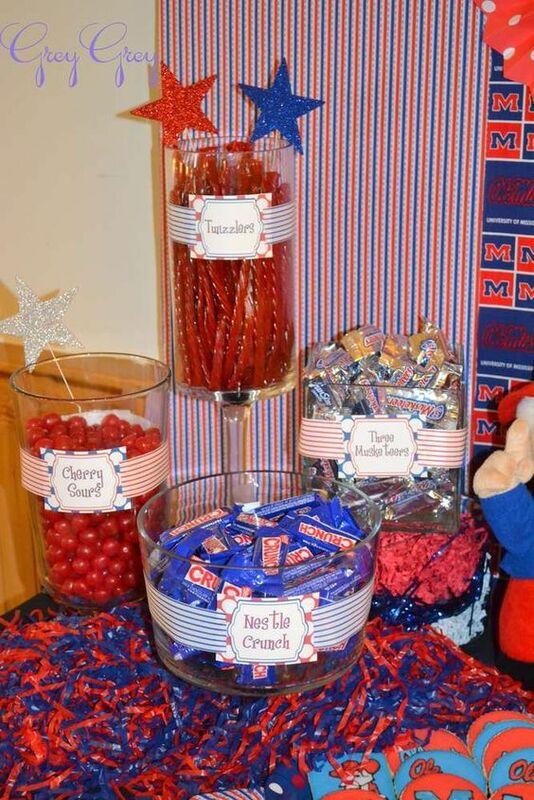 These candy jars make perfect patriotic decorations and treats! 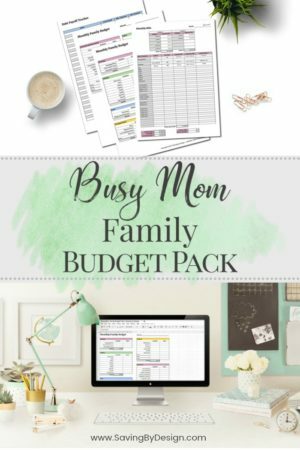 Found at CatchMyParty.com…one of the best parts of this is it’s super fast and simple! Don’t have containers like these? No worries! Make a quick run to your local Dollar Store. I’m sure you’ll find something that you can use for this idea! 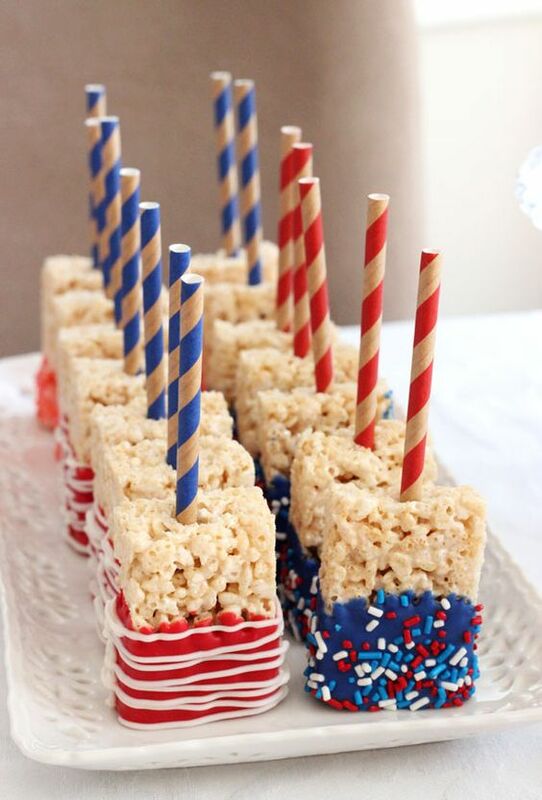 Rice Krispie “Pops” with a twist were found at LifeLoveAndSugar.com and are just so darn cute that the kids will be snacking on these all day! The recipe can be found in the link, but grab some food coloring, some popsicle sticks, and some free time and you’ll have these red white and blue treats whipped out in a jiffy! Fun! 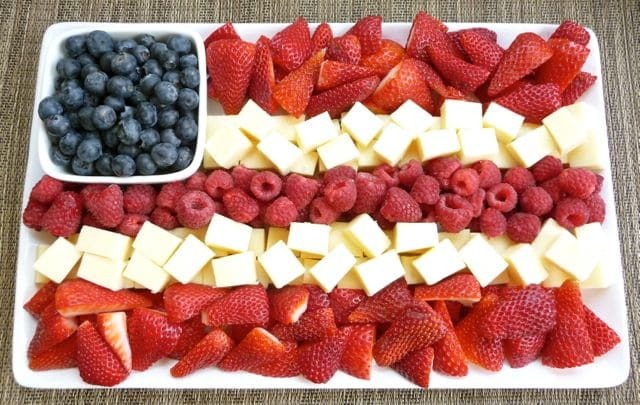 This Fruit & Pretzel Flag Tray that was found at Passion for Savings and brings a bit of healthy snacking with some strawberries and blueberries, along with some yummy white chocolate covered pretzels on the side! I have to admit, chocolate covered pretzels are my FAV, so this treat looks like it’s going to be making a 4th of July appearance at our house! In a variation of the above flag fruit tray, this one will prove to be another hit! Strawberries, raspberries, blueberries, along with chunks of cheese to create your “stripes” will be a yummy addition to the treat table! Find this at TheBetterMom.com. 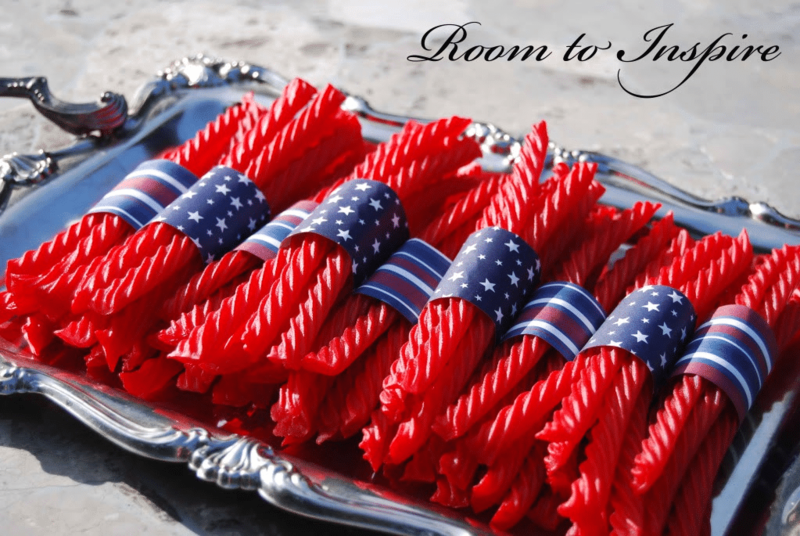 These two american flag trays may have similar looks, but having one on each end of a buffet table will prove successful with the different tastes at most 4th of July celebrations! Now these are a great dessert to make with the kiddos and they’ll have a great time helping out! This was found at OurBestBites.com and it looks like a hit to me! 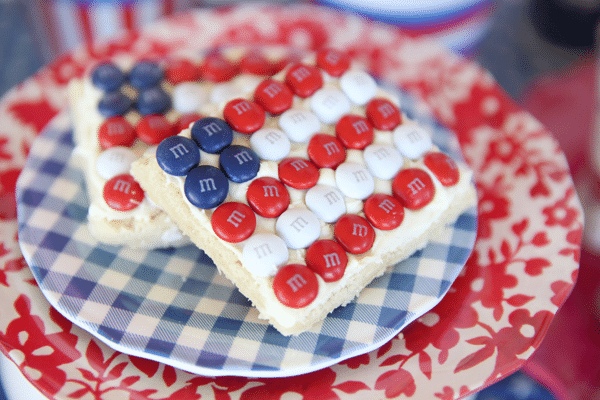 Make some sugar cookies, whip up a nice cream cheese frosting, and grab some Red, White, & Blue M&Ms to create the American Flag! These look mouth-watering and pretty easy, too! Need something quick and easy for a picnic you’re headed off to? Grab some Red Vines and cut up some 4th of July Scrapbook paper into strips, tape the strips together around the Red Vines, and voila! You have some Twizzler Treats! This super fun, frugal, and fast idea was found at RoomToInspire.BlogSpot.com! Now these might take a little more effort, but you have to admit, the kids are going to think they are the most fun hot dogs that they have ever had in their tiny lives! Introducing Rocket Hot Dogs, found at TheyAreCrafty.BlogSpot.com. 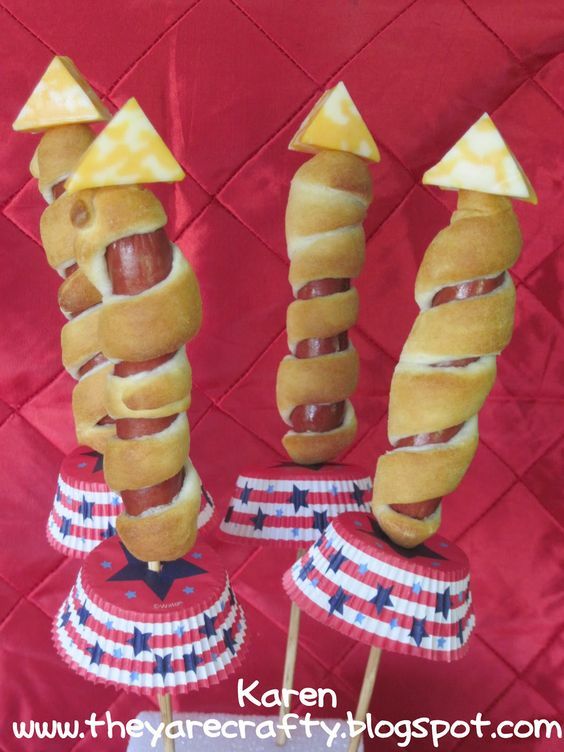 They just require a quick trip to the grocery store, wrapping some croissants around the hot dogs, and topping it off with a triangle of cheese all skewered on a patriotic cupcake liner and lollipop stick. Decorate around it how you want and you will have a bonafide hit on your hands! How fun are these Red, White, and Blue Deviled Eggs from Singing Through the Rain?! Last but not least, what kind of 4th of July party isn’t complete without some S’mores to look forward to around a blazing fire later in the evening as fireworks are going off?!?! 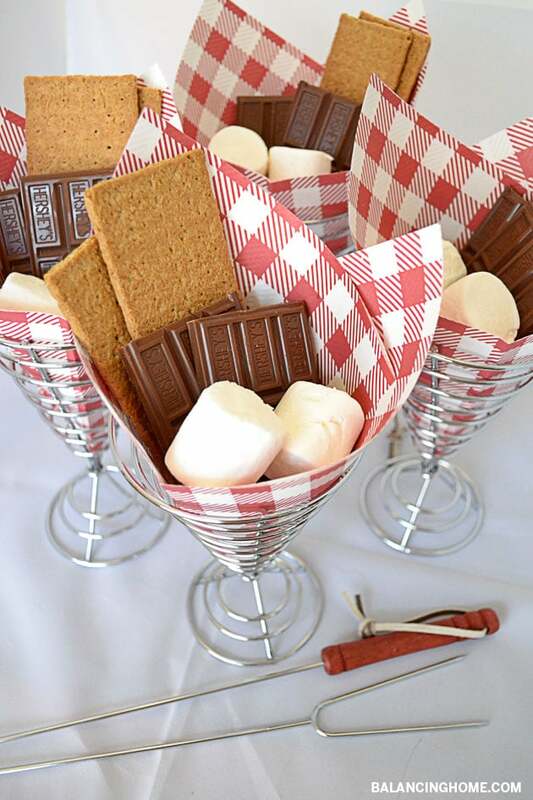 These S’mores Container ideas, found at BalancingHome.com, are definitely going to kick things up a notch in the presentation department! If you don’t have any french fry holders (check Amazon or the Dollar Store, you might find a deal! ), grab some paper cups or make your own cones with themed-scrapbook paper for the event! Stuff them full of all graham crackers, chocolate bars, and marshmallows for some individual s’more servings and you’ll look like a pro! After having your menu under control, it’s always nice to have some awesome home decor around the house to celebrate a festive 4th of July. 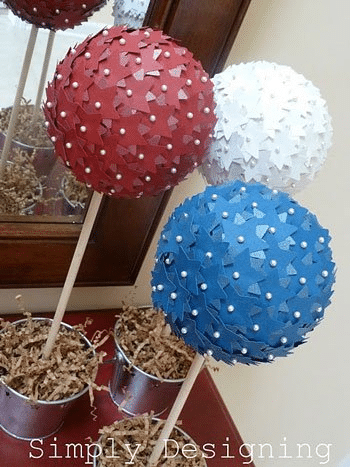 Check out these easy DIY crafts that can be done on the cheap for 4th of July decorations! This might be a bit more time-consuming with 4th of July quickly approaching, but I promise it really isn’t that bad. I’ve made one myself! Grab some paint, find a pallet (check your local hardware stores, I’ve always been lucky to be able to grab a few that they were just going to throw away anyways) and get to work! This idea was found on Pinterest, but it sure has become a hit over the last few months. Get some star stencils to make sure you paint those stars as perfect as possible, paint the slats of wood, and go crazy! It’s such a fun 4th of July decoration. Who doesn’t love the stars and stripes! Speaking of stencils…these Painted Lawn Stars found at The Concrete Cottage are sure to turn your yard into a patriotic paradise! Basically cut out your stencil on a large piece of cardboard, grab some construction marking spray paint, and get to decorating! 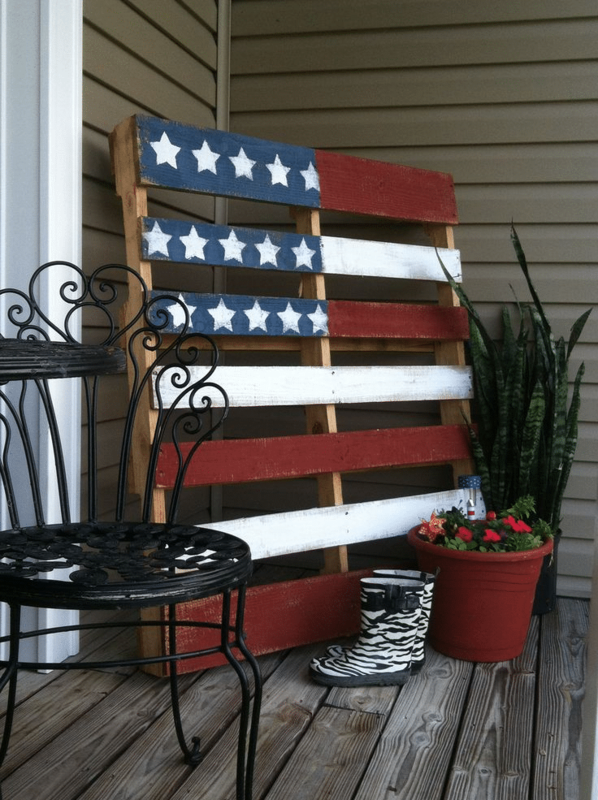 Get the kids ready to help out with this fun DIY 4th of July project! This Colored Sand Mason Jar idea came from AttaGirlSays.com and is a quick and easy way to throw a little festive decor into the house or better yet, out on the deck! 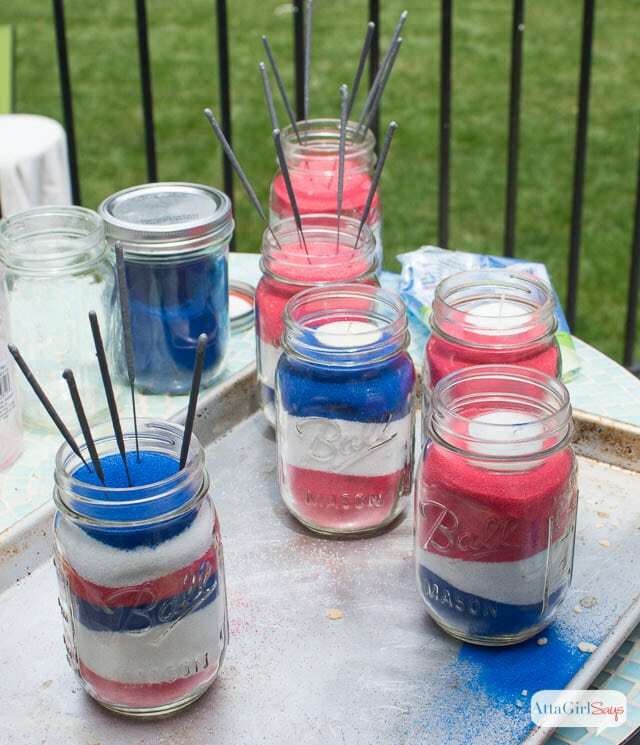 Grab some colored sand from your local craft store and layer it in mason jars for a Red, White, and Blue look. Now comes the fun part… throw some sparklers in there! Or some tealight candles! Those are just perfect at night once the sun goes down! 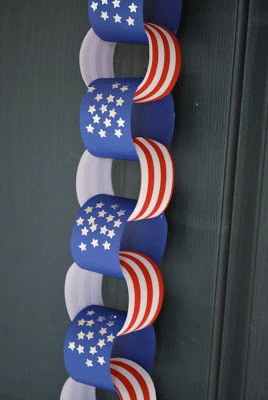 Grab the little ones and have them work on this Patriotic Paper Chain, found on APumpkinAndAPrincess.com. Cut strips from some 4th of July themed scrapbook paper, or even use red, white, and blue construction paper with some star stickers. Be as creative as you want with this one. 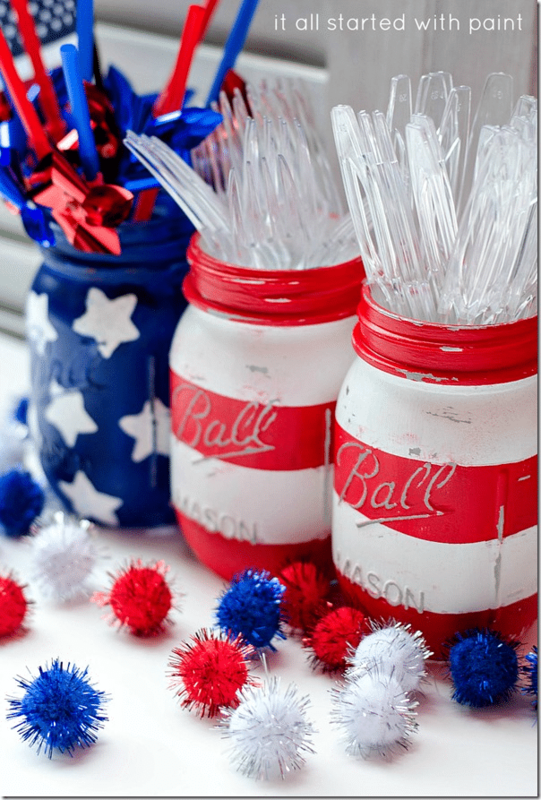 The kids will love the craft time preparing for the 4th of July! Ready to make some Colored Paper Star Topiaries? This idea was found at CraftsnCoffee.com and gives a full tutorial for how to make this. It may look a bit more intimidating than it actually is. I swear you’ll be able to do this in no time! It’s a great DIY project and don’t forget. You can use these for Memorial Day, Flag Day, and the 4th of July! Multiple uses throughout the year! Check out the tutorial in the given link. You’ll be able to use these for holding silverware for the picnic, flowers on the deck, or anything else that comes to that creative mind of yours! Love it! What better way to end these fun frugal ideas than with presents! These 4th of July Kiddo Treat Buckets come from KamiBuchanan.BlogSpot.com. The dollar store will have many of the items you may need to put something together for all of your little guests. 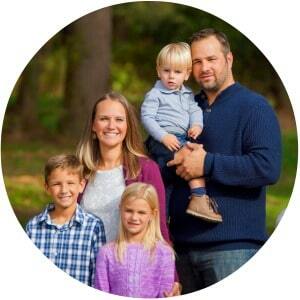 Remember…the more occupied you keep them, the more socializing you’ll be able to do with the rest of the adults! I hope that this gets you started on some wonderful and quick projects for the upcoming 4th of July holiday! I don’t know about you, but I still can’t believe we are approaching the 4th of July already! Enjoy, be safe, and have fun! I hope you love making these frugal food and craft ideas as much as I do! It would be nice if you mentioned the color of paint used on the pallet flag. Would love to know the colors used on the pallet.